We had to buy the book while we were taking Bradley Childbirth classes in Salina with the wonderful Maria Rapp. I was pregnant with Jupiter and thinking that I needed to have a c-section with him and came across an announcement for the local La Leche League meeting in the newspaper. It was a special meeting with speakers from the local area that do childbirth classes and nurses from the hospital. I went to the meeting and won the door prize!! 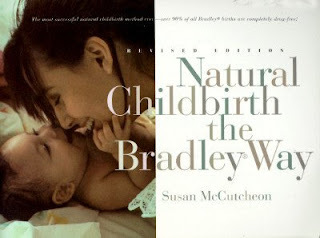 It was the book Natural Childbirth The Bradley Way. I was able to hear Maria talk about her childbirth class and I asked her questions about VBACs. (vaginal birth after cesarean section). My care provider at the time had mentioned VBAC about 3 days before all of these people, books and events fell into my life. This experience sent some changes in motion that have stayed with me and built over the years. The idea that doing things differently, things that seem fringe and the exact opposite from my family, crazy to some are exactly what I need and what works best for me. Its why I chose to be with Jaymon so many times. He was different and that is attractive to me. So now I am a barefoot runner. I am part of a fringe group that runs for the joy of it and despite odd looks and sometimes downright hostility from other runners or people who just oppose to people who do what they believe works even though it is not what the podiatrist or doctor or better yet the shoe salesman says is "right". Here is the anxiety part of the post. I am driven to improve myself. Despite my best efforts to stay the same and be depressed and feel sorry for myself and just do what everyone else does and blend in to stay safe and stay the little girl from my past, I get out there and run in my naked feet. It works. It works for me and I love it. Its hard to be an attention atractor and it makes my stomach turn at times but it works and I just can't pretend that it doesn't. Just like having my babies at home, not vaccinating them, eating foods that keep gravitating to whole foods with little meat, homeschooling, extended breastfeeding ect. ect. ect. The list goes on and on. I can't help it and I know it and so far it seems like the other barefoot runners are in search of self betterment and on a similar path. I knew that my life would change when I fell in love and persued my soul mate. I knew he would accept me for who I am. He was different. I had never met anyone like him before and I knew that he represented a sense of freedom and escape that I was longing for. He has such wonderful and different ideas. He also represents hard work. Its been a long hard journey up until this very moment and is a continuous struggle with the duality in myself. I have to accept myself. Freak and all. But he is there to suggest that maybe I should run barefoot or maybe I should consider fixing it myself instead of running off to the doctor or sometime just sit back and wait a while. The ideas he suggests and I fight against almost every time are the ones that have changed me and were crutial to challenging my old ways of thinking. Challenge me to let go of platitudes that no longer work. I always come around to these crazy ideas and love them. They fit, they work. Someday I might have to buy the book again from Amazon marketplace if I ever decided to teach Bradley Childbirth classes. Its something I think I will enjoy someday. I could alternate days where I teach Chi running in my barefoot running group and childbirth classes. Until then I will get out there and run barefoot and think some more about change and how to breathe through it all.